My version of chile colorado is made with a combination of four different dried chiles making for a deeply flavorful, moderately spicy, gorgeously red sauce. 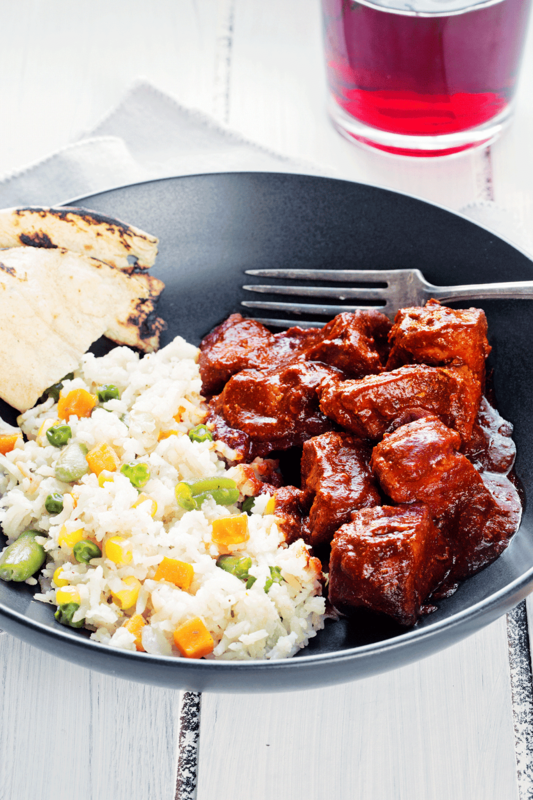 Here, we've stewed pork in it but you can substitute beef, lamb or goat. 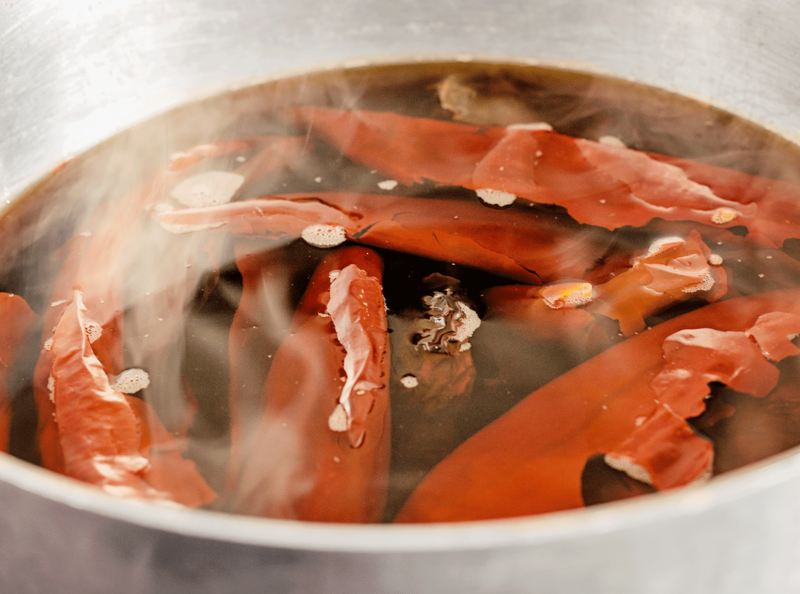 Continuing my quest to de-mystify the use of dried chiles in your kitchen, today I’m sharing one of my favorite Mexican stews (guisados in Spanish) that highlights the use of dried chiles: chile colorado. Colorado means red in Spanish, which, in this sauce, comes from the dried chiles. 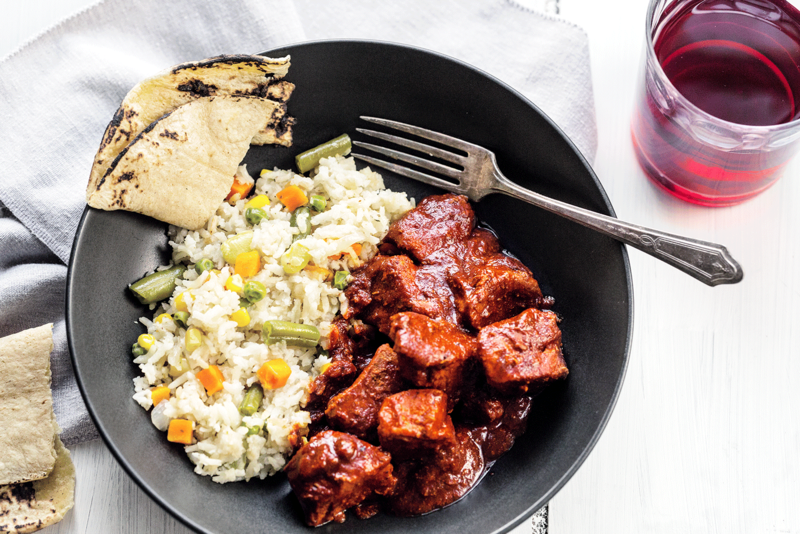 The protein in this dish can be beef, pork, goat or lamb. It can also be used in vegetarian dishes with nopales (prickly pear cactus), potatoes, carrots, onions and cauliflower. 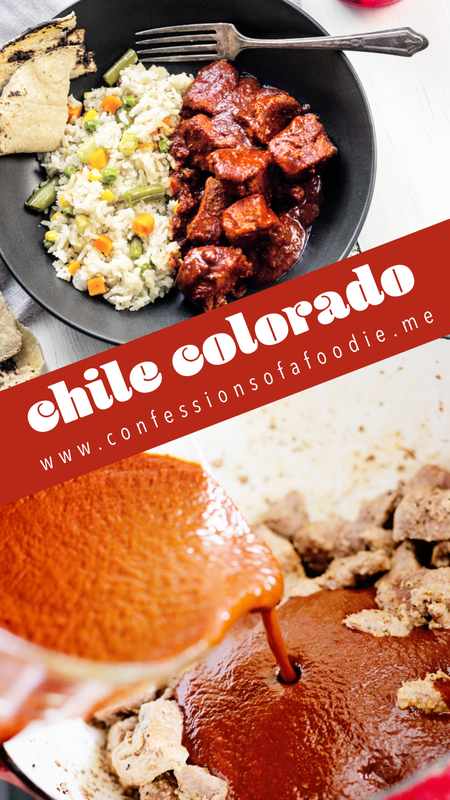 I have already shared a chile colorado dish with you here in my how to cook beef tongue series which is made with powdered chiles. It's fast and easy and great for shorter cooking times. 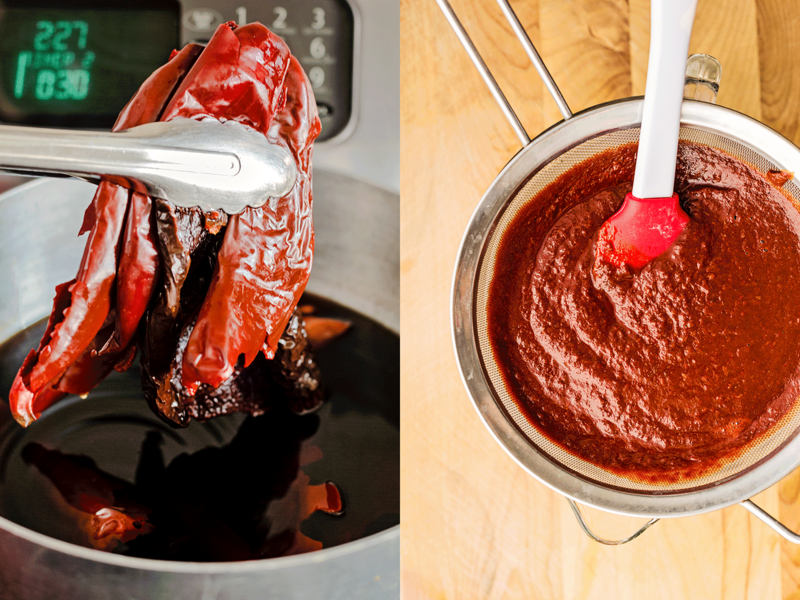 Today's method turns out a deeper, more fruity and flavorful sauce better suited for braising, stewing and even for tamale fillings. Today, I’m using pork shoulder which benefits from long slow cooking. California: dried Anaheim peppers that are relatively mild. These are the most used in our family’s recipes from enchilada sauces to moles and chile colorado. Ancho: dried ripe poblanos. Erroneously, both fresh and dried, these are often labeled as “pasilla” here in the U.S. which is a completely different pepper. 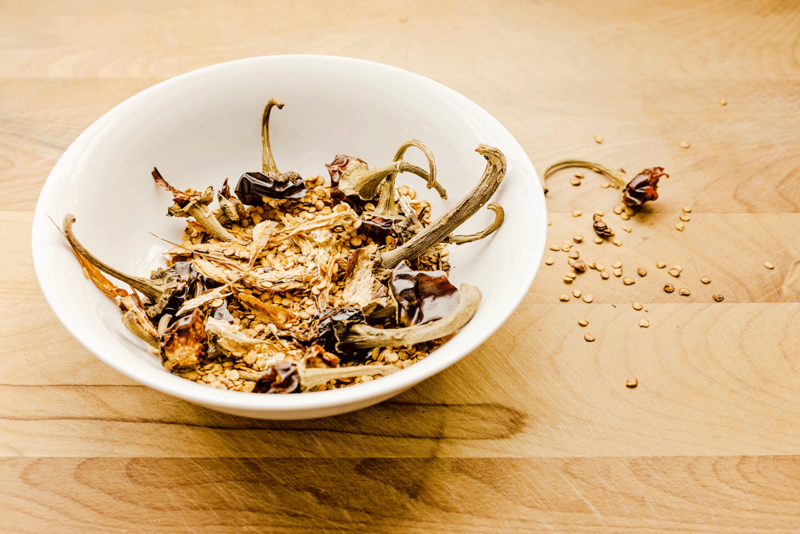 Anchos have a sweet, smoky flavor that are best used in combination with other chiles to help add balance to sauces. 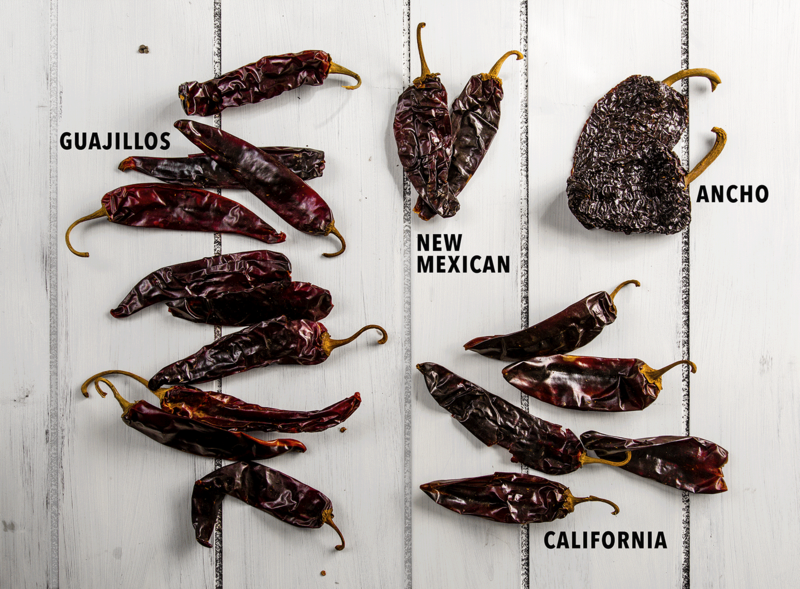 New Mexican: these can range from medium to very hot depending on where they were grown. 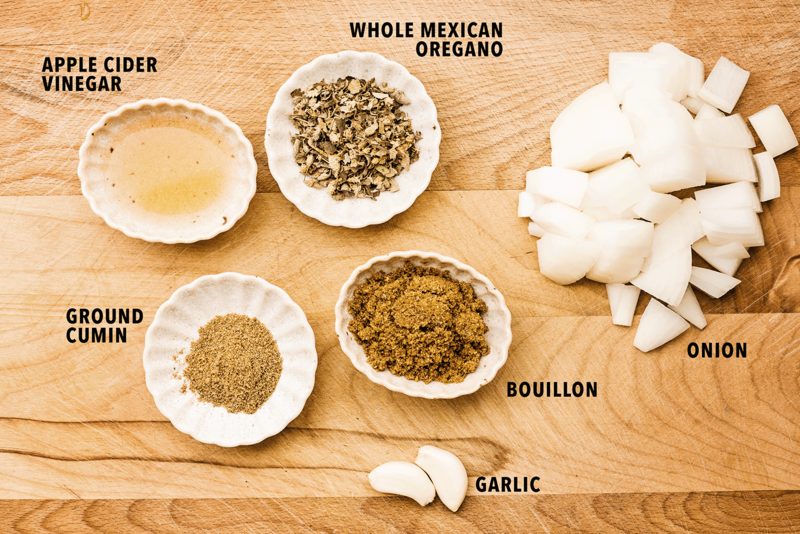 They add an earthiness to sauces. Guajillo: these are a mild to medium heat pepper that add a nutty flavor to sauces (and they’re my personal favorite). When cooked, they add a gorgeous red color. The chiles get the stems and seeds removed, as usual when working with dried chiles. They'll get rehydrated, blended then strained to make a smooth sauce. Then the sauce gets added to the pork and continues to simmer for at least 30 minutes or until the pork is fork tender. I’m serving this over white rice with mixed vegetables (arroz blanco con vegetales). My mother made this often when I was growing up with copious amounts of butter and black pepper. I’m serving here with neither so it can take a nice swim in the sauce. If you’re short on time, you can skip the toasting step but I like to do it as it adds just a little more flavor to the rice. Mom didn’t toast and we didn’t miss this step at all. Not toasting also makes for a whiter rice as toasting will make it a little golden. This sauce is slightly fruity, smoky and nutty tasting, with a mild to medium heat depending on the heat of the New Mexican peppers. The recipe makes enough sauce for up to 4 pounds of meat. I had just over 3 pounds and sopped up the sauce with tortillas and rice. You can also use leftover sauce for eggs or even use it for a couple of quick enchiladas. Remove the stems, seeds and veins from the chiles. Place them in a medium pot and fill with water to cover, place on heat, cover and bring to a boil. As soon as the water is boiling, turn off heat and allow to steep, at least 30 minutes. 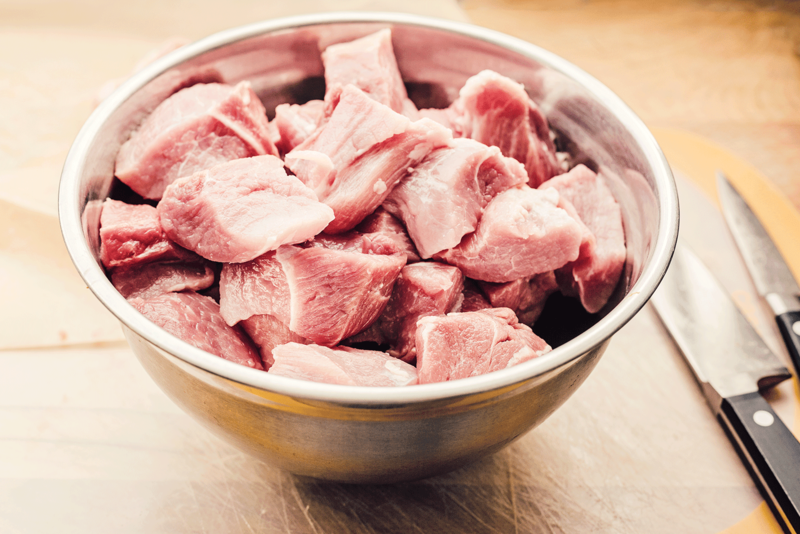 Remove visible fat from pork and cut into 1-inch cubes. Heat oil in a heavy-bottomed pot (I use my 5 quart cast iron Dutch oven) over medium heat. 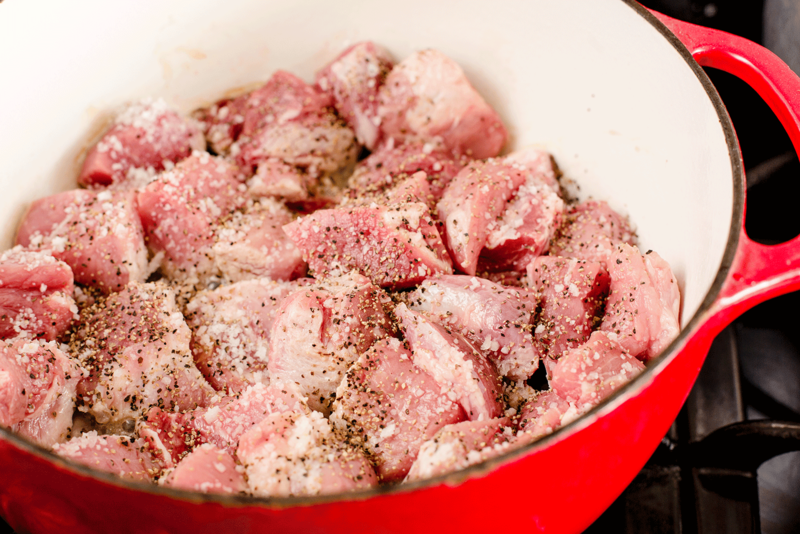 Add pork; sprinkle meat with salt and pepper. Cook for 10 minutes, stirring occasionally to brown pork evenly. Lower heat to second lowest setting, add ⅓ cup water, cover and let meat slowly simmer for 45 minutes, lifting lid to stir meat halfway through. While meat is cooking, remove half of the now rehydrated chiles to a blender, along with 1 cup of water, half the onions, and all of the garlic, cumin, oregano, bouillon and cider. Blend until smooth. 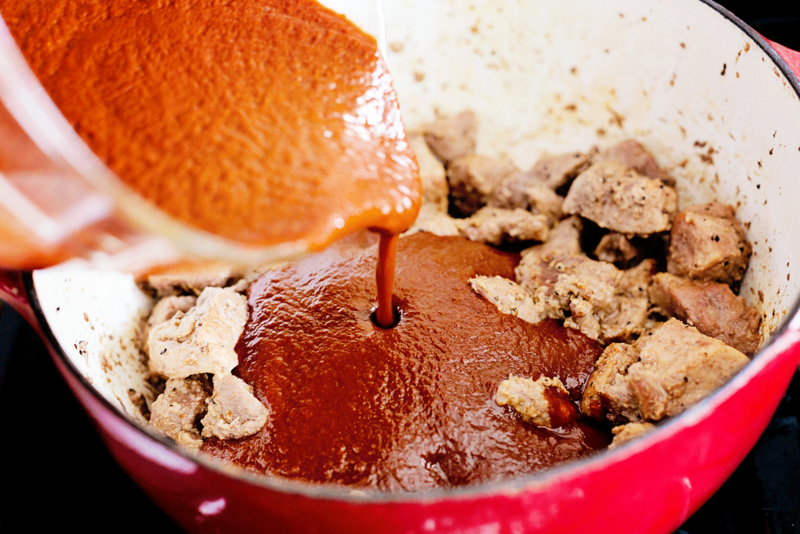 Pour the chile puree through a fine mesh sieve into a mixing bowl, using a spatula to push the sauce through. Discard the pulp left in the strainer. Repeat this process with the second half of the chiles. the rest of onions and 1 cup of the water. Once this second batch of puree is pushed through the sieve, add the last ¼ cup of water to the blender and swirl to “clean” jar, add to the bowl of sauce. Stir the sauce well. Once meat has simmered for 45 minutes, pour the chile sauce over the meat, stir well to coat, cover pot and simmer on low for 30-45 minutes or until the meat is fork tender, stirring occasionally to keep from sticking. The chiles will release some of their oil, stirring will help reincorporate it into the sauce. While the chile colorado simmers, add 1 tablespoon avocado oil to a medium saucepan. 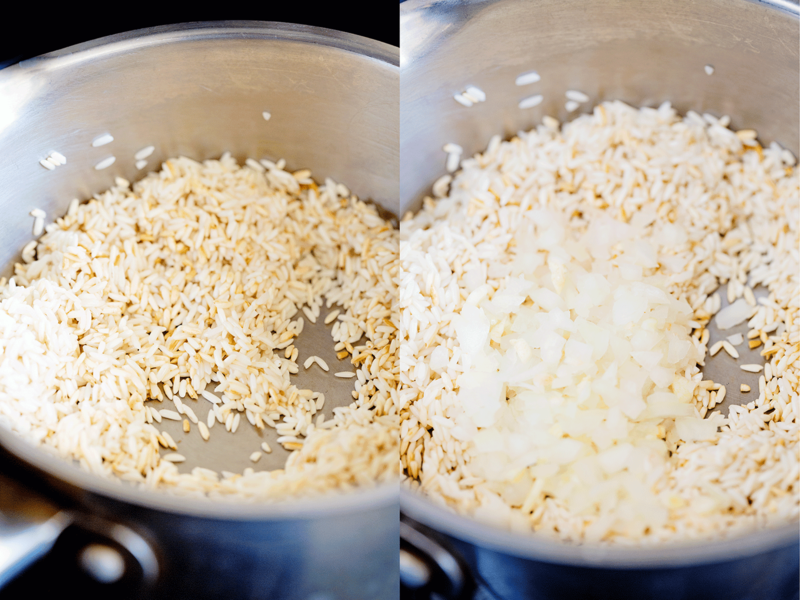 Once oil is shimmering, add the rice and stir. Continue stirring until the rice just starts to get color, this should take about 5 to 8 minutes. Toss in the onions and garlic, cooking for 1 minute, stirring continuously. Add the water and bouillon. Add the oregano by crushing it between your palms (this helps release the herb’s oil). Cover and bring to a boil. Once boiling, turn heat to low, set timer for 12 minutes. At the end of 12 minutes, turn off heat, do not lift lid; set timer for 5 minutes so the rice can finish cooking by steaming. 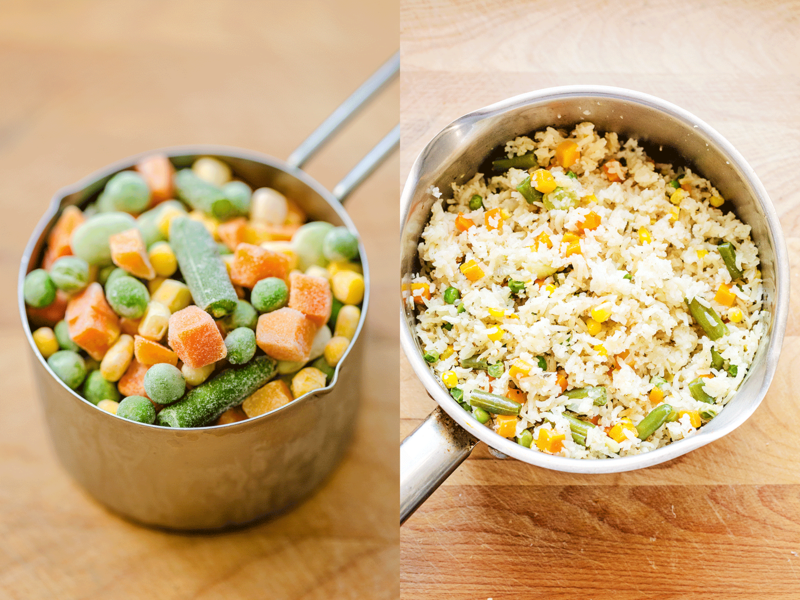 In the meantime, place vegetables in a microwave safe dish and microwave for 2 minutes. When the 5 minute timer goes off, fluff the rice with a fork and stir in vegetables. To serve, add rice to a bowl and ladle meat over rice.